With these words Eric Gatlin, toward the end of his visit to the Italian plants of Avio Aero, sums up his journey from Brindisi to Cameri, passing through the Turin Additive Lab. Gatlin is GE Aviation’s Additive General Manager. His team is responsible for leading, connecting and supporting GE Aviation factories worldwide that manufacture or intend to manufacture additive technology (aka, metal 3D printing). “During my first six months in this role, we focused on understanding which aircraft engine parts were candidates for a 3D print production processes, starting from the nozzles of LEAP and blades of GE9X, and going beyond the GE Catalyst,” says Gatlin, noting that today more than 100 total parts are in development with additive manufacturing for GE engines. Gatlin has been with GE Aviation for three years. Having come from the automotive world, he began his career 20 years ago as an electrical engineer designing electronics and safety systems for vehicles before moving on to supply chain. Gatlin has worked across all areas of supply chain for about ten years. His first contact with the additive world took place at that time, during his visit to the Additive Technology Center in Cincinnati. When Gatlin met the Brindisi team, he found a highly motivated group ready to cut the ribbon and start working in one of the factories of the future that will being producing a dozen parts for GE Catalyst using machines from GE Additive’s Concept Laser company. The team itself, thanks to additive technology, now has a clear industrial advantage. With technical cross-pollination between different jobs, it will make the engine of the new regional aircraft Cessna Denali, by Textron Aviation, even more efficient. With Catalyst, additive manufacturing has made it possible to reduce about 855 parts of the engine to only 12 thanks to the use of 3D printing. But the Brindisi team added a further reduction on the air-oil heat exchanger, ACOC (Air Cooled Oil Cooler), which is one of the three heat exchangers on the GE Catalyst. The ACOC is used to cool fundamental parts of the engine. Near the bow of the new Textron aircraft, under the propeller of the engine, there is an air intake which conveys the air toward the ACOC which is inside, on the front part of the engine, next to the air intakes. Davide Losapio is the designer from the Apulia Engineering Centre of Avio Aero who has designed the new shape of this component and has also simplified it. The Catalyst’s ACOC had so far been made up of two parts: the main part printed in 3D, and the protective screen that performs the crucial task of avoiding impact with objects or external bodies (the so-called FOD, foreign objects damage, a ‘bogeyman’ for shop floor professionals) that could get into the air intake. This solution was also requested by Textron itself. ACOC is currently produced by ATC in the USA, but once the validation and certification phases are over, it will enter the production catalogue of the new Salento additive area. The contamination, which started from the FOD topic, has been managed successfully through the exchange of knowledge and experience between designer Losapio and Paolo Volpe, Additive Manufacturing Engineer of Brindisi, starting from the re-design phases of the component. The magic of additive manufacturing also enables the ability to prototype, to manufacture in the machine, and the transition from design to the real object are so fast that the combination of design with production requirements is almost natural. 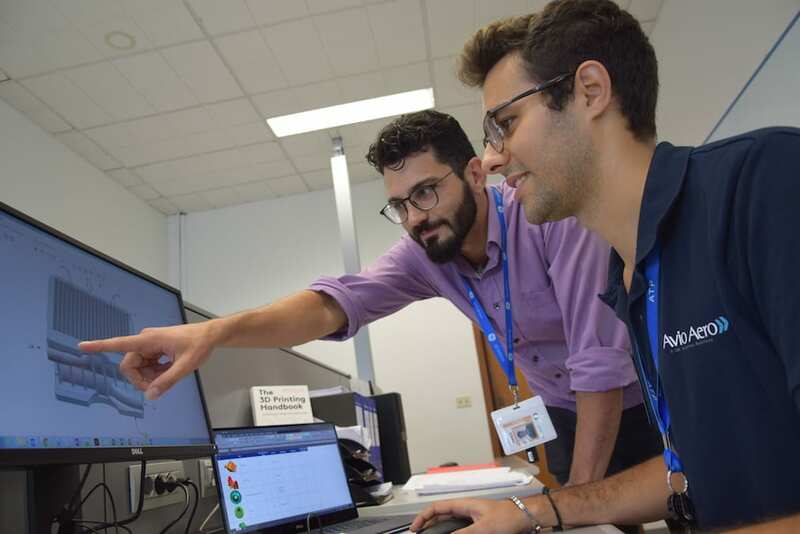 For this reason, the Brindisi site is enriching its staff with professional roles who are familiar with metal 3D printing, specifically those who are raising the technological level in southern Italy. Paolo Volpe, 31 years old, has been in Brindisi for a few months. For Losapio, by contrast, this was his first true design for additive experience. Antonio Gaglianello is the leader of the latter team, which has a dual role: It offers engineering of the main engines that have always been overhauled and repaired in Brindisi, and also supports the design and development of the NPI (New Product Development), and the Catalyst certainly falls into the category. “This part of our work allows us to completely rethink our products thanks to additive manufacturing”, explains Gaglianello who, with a decade of experience in aeronautical design, does not hide his enthusiasm for the new technology. From an original shape, which is geometrically rigid, produced by brazing, today ACOC takes on a unique shape, with a wavy surface in an alternating direction. It can also be produced in a single machine with a laser beam that in a few minutes melts and combines metal powder. “Brindisi will be one of Aviation’s richest production sites from a technical point of view, from the size of the parts, small or medium-large, to a whole series of new metal powders that will be used,” said Gatlin. The newly additive designed ACOC (Air Cooled Oil Cooler) takes on a unique shape, with a wavy surface in an alternating direction. It can also be produced in a single machine with a laser beam that in a few minutes melts and combines metal powder.